Limited Time Offer! 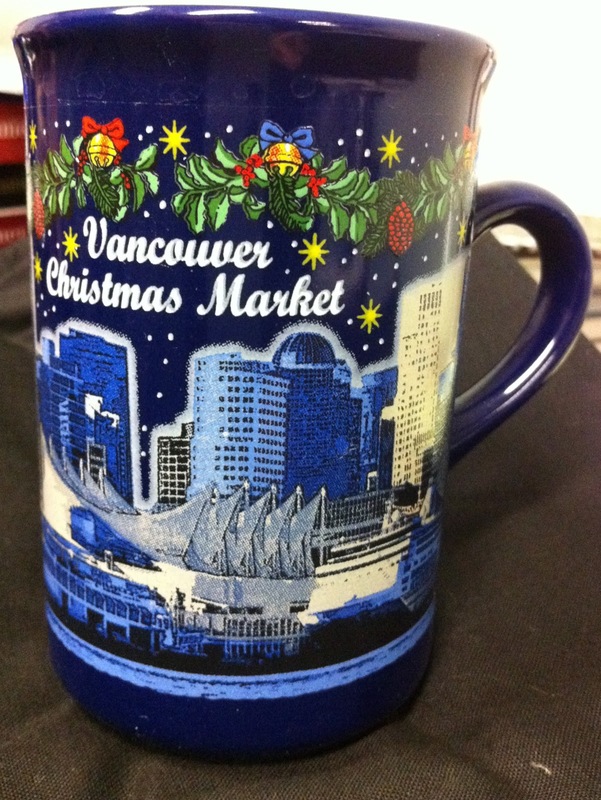 The Vancouver Christmas Market – Condiment Udders & the Glutton Cup! Ho, Ho, Ho, Ho, Ho! A Cup for Festive Eating! No matter where you work, lunch can get monotonous sometimes; same food items repeating it self again and again. That’s why I always keep an eye out for something new to break the lunchtime rut. The Vancouver Christmas Market, on the NE corner of Georgia and Hamilton, recently opened for the Holiday Season. To attract downtown workers to come to the market during the 9 – 5 workday, the organizer have offered a special 2 for 1 entry lunch pass valid from 11am to 2pm, Monday to Friday. The organizer really put some thought into this offer as it really caters to office workers. You print the 2 for 1 entry pass from their website (http://vancouverchristmasmarket.com/tickets.php), and since office workers only get 45 to 75 minutes for lunch, pass holders can use the VIP lane for a speedy entry. As an added incentive, if you purchase food from 6 out of the 10 featured food stalls on the 2 for 1 pass you get a free gift. A new lunch option, discounted admission, VIP service and a free gift just for eating lots – hmmm this was a no-brainer. As much as I can eat I didn’t think I could eat from 6 food stalls on my own so I asked my colleague who loves food to join me on my adventure and to take advantage of the 2 for 1 pass. Since we both wanted to have some time to look at the other items for sale at the Christmas market, we both decided to pick up the food to go at the end of our visit and eat back at the office. All the food vendors were very friendly, willing to talk about their food and were accommodating in wrapping our food to go. -The set up for the SWISS RACLETTE was very interesting. The Farm House Natural Cheeses is local producer from Agassiz, BC. They use their Alpine Gold cheese for the raclette. The lady preparing our dish said Alpine Gold is similar to Oka Cheese from Quebec. Melted cheese is delicious plain and simple, so it came at no shock we both enjoyed the swiss raclette but we both realized this isn’t something you can have lots of. In this case, less is more. 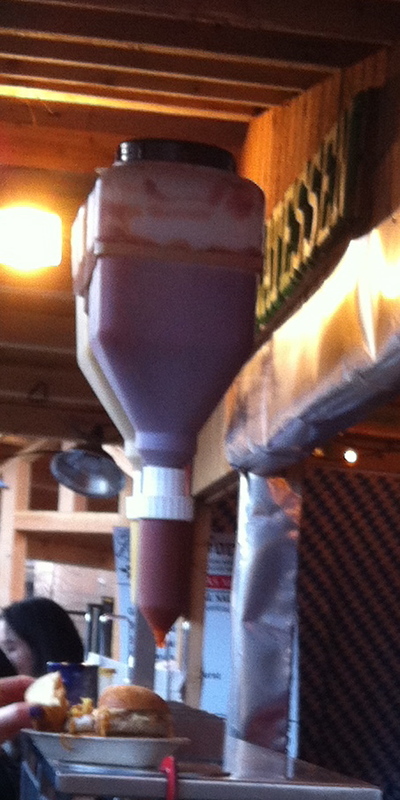 -The CONDIMENT UDDERS at Black Forest Meat & Sausage. At first we really perplexed on how to get mustard on our bratwurst. Then we both realized we had to “Milk” the thing! I’ve never seen anything like it and after much thought realized it was a very efficient design for dispensing condiments. We found the Condiment Udders very amusing. The bratwurst was savoury & tasty and if we do a second run, we may opt for the giant bratwurst. -The SCHNITZEL WRAP. It doesn’t look like anything special but since we got there after the main lunch rush, the nice gentlemen at the Schnitzel-Haus made the schnitzel fresh right in front of us. The breaded cultlet was crisp and still moist. I might go back to Christmas Market just to pick up Schnitzel for lunch. -I really enjoyed the SALMON KABOB from Captain Randy’s Seafood. It was well prepared salmon kabob that wasn’t dry. The guys that run the stall are seasonal (June – September) fisherman who fish off Haida Gwaii (formerly known as the Queen Charlotte Islands). After enjoying our $44 feast, my cohort and I were ready to pull a George Constanza and take a nap under our desks. I enjoyed speaking with the food vendors and was happy that I was supporting local BC businesses! So what did we get for our gluttony? A free Christmas Market Mug! A very nice badge of honour for festive eating.